Since archaeologists are supposed to be able to work worldwide, the request to participate in the digital recording project of the lager beer vaults at 33 Ten Eyck Street in Brooklyn was not that much of a surprise for me. Nevertheless, when appointed 2015-16 Visiting Research Scholar at NYU’s ISAW, I did not expect to be involved in NYC urban – and underground archaeology. Under the direction of Dr. Celia J. Bergoffen, Ph.D. 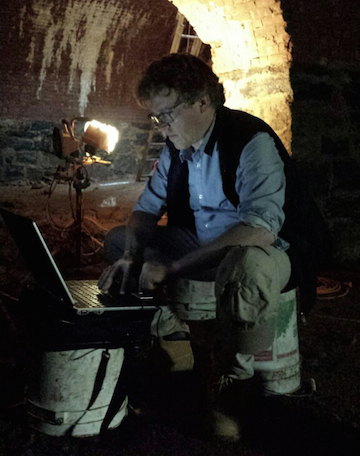 R.P.A., who is an Adjunct Associate Professor at the Fashion Institute of Technology as well as a contract archaeologist, a complex of four vaulted chambers was recorded. NYC’s Landmark Preservation Commission (LPC) and the State Historic Preservation Office (SHPO) recommended that the site be listed on the National Register of Historic Places, which requires very detailed documentation. The vaulted chambers once belonged to the brewery in Maujer St owned by Sebastian Schnaderbeck, a German immigrant to New York, who was in business in the 1860s. The creation of deep cellars or “lagering caves” was necessary for the manufacture of lager, which requires aging at cold temperatures. According to the available sources, Schnaderbeck’s brewery cellars belonged to the earliest of such structures in Brooklyn. 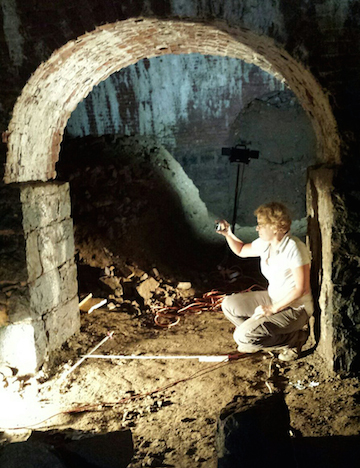 Celia and I recorded the vaulted chambers with Structure from Motion, a very cost-effective recording technology, although the light conditions within the subterranean vaulted chambers were anything but ideal. But with the help of four 500 watt halogen work lamps and equipped with a gopro camera, the video recording of the vaults proceeded quickly. After seven working days the field-work was completed. Berlin-based surveyor Matthias Kolbe processed the data and generated 3D-models. ISAW graduate student Georgios Tsolakis joined us during the process and made valuable additional contributions in data recording and processing. Unfortunately, three of the four vaults will be filled with concrete and buried under a projected residential building. The fourth, which will be under the yard, will not be filled, but no access will be provided. Nevertheless, thanks to our collaboration, this important archaeological site will become part of the historical record of NYC’s urban and 19th century immigrants’ history.